Every year, dozens of marathons, triathlons, and bike races, both competitive and charity, are hosted around Italy in some of the most beautiful locations in the country. Here now is a list of the most popular and interesting athletic competitions in Italy. Make sure, if you want to participate, you get your Certificato Medico Sportivo Agonistico from a local certified Italian sports doctor. Some of these events will also require you to enroll with sports organization. Check the details of the race to understand the requirements. Rome Marathon/half-marathon (March). Runners are lead on a course around the city center and to the edges of the city. The race hosts up to 20,000 runners each year. A fun-run and charity race occur in tandem with the marathon. Be mindful of the ancient cobblestones which cover the start and end of the race. 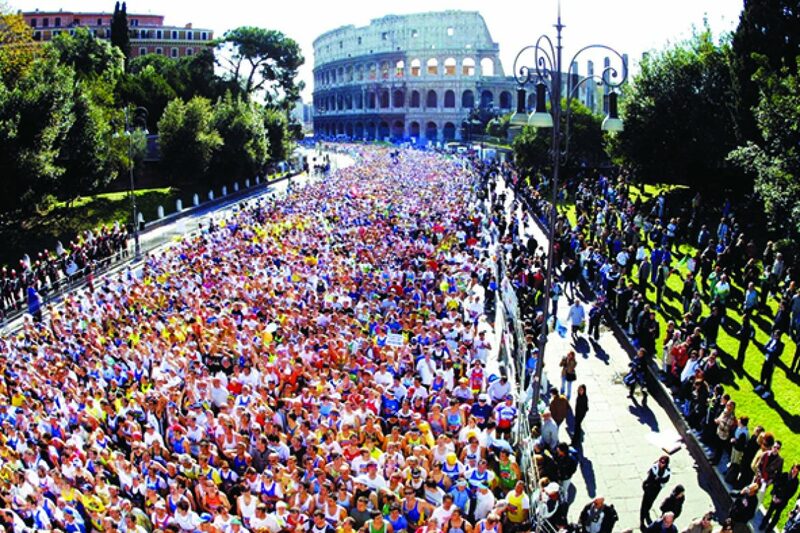 http://www.maratonadiroma.it/. Stramilano Half-Marathon/10k/5k (April). One of the world’s biggest marathons, it hosts 50,000 runners ever year with the course running through the city center. http://www.stramilano.it/. Ecomaratona dei Marsi/ 13k (May). This trail race winds through the Abruzzo region with much of the course set in nature and past archeological sites. The course is hilly and climbs to almost 2000m above sea level. http://www.ecomaratonadeimarsi.it/. Ecomaraton di Chianti/half marathon/14k/10k/8k (September). This trail race is set in the heart of Chianti wine country and racers pass through vineyards and the surrounding countryside. Participants can enjoy local wine and cheese at the water stops in conjunction with traditional race supplements. http://www.ecomaratonadelchianti.it/website/. Cortina Dobbiaco (May). This is a 30k race through the Dolomite Mountains. Runners race through old railway tracks, bridges, tunnels, and mountain passes. Lake Garda Marathon (held in September annually). This race circles Lake Guarda and features a mostly paved asphalt course. Runners start in Limone and race to the other side of the lake finishing in Malcesine. Rome and Juliet Half-Marathon (October). This race takes place in Verona, the setting of Shakespeare’s most famous romantic tragedy. Participants run through the city center and a finisher’s pasta party is held at the conclusion of the race. http://giuliettaeromeohalfmarathon.it/en/. Venice Marathon/10k/4k family run (October). Imagine running along Venice’s famous canals and over the many bridges that connect the lagoon. Participants finish in St. Mark’s Square. http://www.venicemarathon.it/it/venicemarathon/. Florence Marathon (November). One of Italy’s most visited and beautiful cities hosts an annual marathon that covers a path from the Duomo to the Arno river and finishing in Piazza Santa Croce. http://www.firenzemarathon.it/index.php?lang=en. See the wonder of Tuscany, Lombardy, and the Dolomites by bike. Most Italian cycling events take place in the northern part of the country. The majority are road races, but a few trail races are popular as well. The following list will include only races open to amateur cyclists as other races, like the UCI Cyclo-Cross World Cup or Giro d’Italia, are available only to full-time, sponsored professionals. Maratona des Dolomites, Badia (July). This amateur race is hosted in northeastern Italy and winds through the famous Dolomite mountain range. 9000 riders from 40 different countries participate. The course is 138km and climes to an altitude of 4230 meters. While the race is open to only non-professional riders, all participants must be enrolled with UIC to register for the race. http://www.maratona.it/en/. Gran Fondo Stelvio Santini, Bormio (June). Gran fondo litterally means big distance. 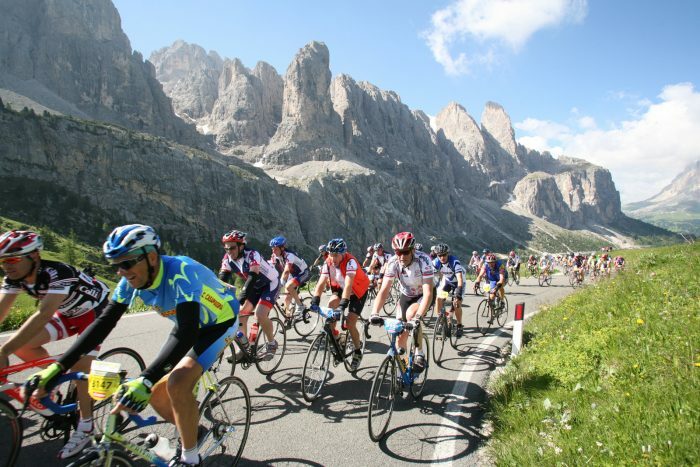 Gran Fondo hosts a variety of amateur races throughout Italy. This particular race features two iconic clycling climbs from professional cycling: the Mortirolo and Stelvio, both of which are used during the famous Giro d’Italia professional race (think the Tour du France but for Italy). The race is 95miles long and includes 20,000 feet of climbing. http://www.granfondostelviosantini.com/. Sportful Dolomiti Gran Fondo, Feltre (June). This is the hardest Gran Fondo race, covering 136 miles and over 17,000 feet of climbing. There is an alternative, shorter, 78 mile course with nearly 9,000 feet of climbing. This race also takes place in the Dolomites and showcases the famous cycling routes Croce D’Aune and Passo di Rolle. http://www.gfsportful.it/en/. La Fausto Coppi, Cuneo (July). There are two race options for this event: the 100 mile route or 68 mile route. The races take place along the foot of the Maritime Alps with climbs between 2500 and 4000 meters. This race features Colle Fauniera route used in the Giro d’Italia. http://www.faustocoppi.net/new/. Gran Fondo La Leggendaria Charly Gaul, Tento (July). Named after famed cyclist Charly “Angel of the Mountains” Gaul, this race takes place between the Monte Bondone and the Valle di Laghi lakes surrounding Trento. There are two courses: 88 miles and 35 miles with climbs of 13,000 feet and 6500 feet. http://www.laleggendariacharlygaul.it/en.html. Granfondo Campagnolo, Rome (October). 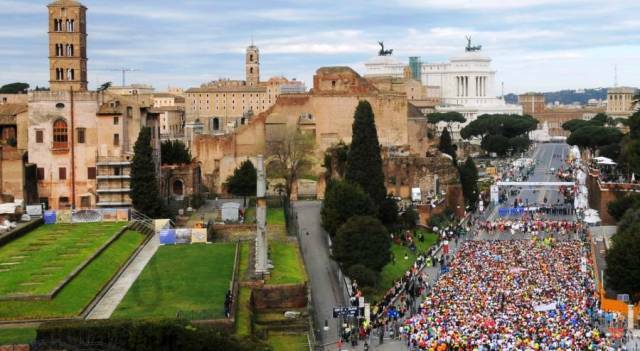 This race takes place in the Eternal City, winding between the historic city center and surrounding seven hills of Rome. The race is 76 miles long with nearly 2000 meters of climbing. http://www.granfondoroma.com/en/. Nove Colli, Cesenatico (May). The Gran Fondo’s oldest race takes place through the nine hills of Cesenatico. 10,000 riders compete from all over the world in one of the two offered races: 124 miles with 4000 meters of climbing or 81 miles with 2000 meters of climbing. The route is more hilly than steep inclines. There is even a mini Gran Fondo offered for children and families. http://www.novecolli.it/. Granfondo Firenze (Firenze). This race occurs on the roads circiling some of Tuscany’s most prized vineyards and most luscious countryside. The starts and ends in the Florentine historic city center. Water and food stations offer wine and cheese as well as traditional supplements. There are two races: one 117km and the other 84km. http://www.granfondofirenze.it/en/. La Campionissimo, Aprica (June). Hosted in the Italian Alps, this race includes iconic Giro d’Italia climbs Gavia and Mortirolo. There are two races: one of 108 miles and 4500 meters of climbing or 96 miles with 3600 meters of climbing. It is considered one of the most beautiful and iconic races in Italy for amateur riders. http://www.granfondolacampionissimo.com/it/. 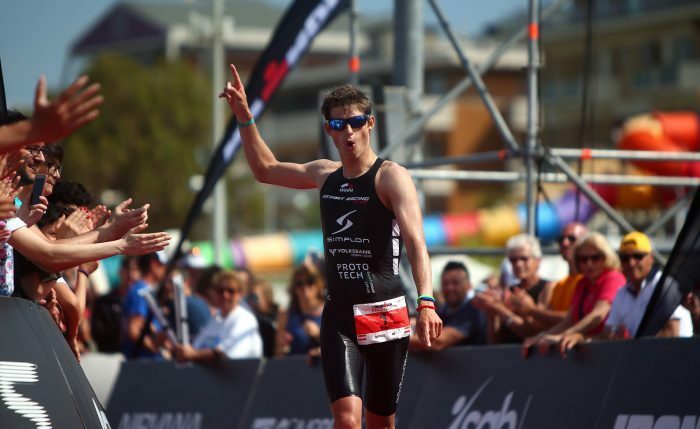 If you want to take your athleticism to the next level, consider taking part in a triathlon in Italy! Your Certificato Medico Sportivo Agonistico must be specific for triathlon events. Here now is a list of events, from half to full Iron man. Half Ironman 70.3, Pescara (June). This is a half Iron Man course (1.9km swim, 93km bike ride, and 21.1 km run). Participants swim in the Adriatic Sea, bike through vineyards and olive groves at the foothills of the Abruzzo Mountains, and run from the beach to the Pescara city center. The first 35 finishers will qualify for the future Ironman 70.3 world championship. http://eu.ironman.com/triathlon/events/emea/ironman-70.3/italy.aspx#axzz4VeQ4fI2X. Sardinia 70,3, Half Triathlon, Cagliari (April). This half triathlon takes place in Chia, Sardinia (located in Cagliari), and features a 1.9km swim in the Mediterranean, a 93 km cycle on the coast, and 21.1km run that ends at the Chia Beach. This beach was voted “Most Beautiful Beach in Italy” in 2016 by Legambiente. http://www.followyourpassion.it/chiasardiniatriathlon_eng.html. Challenge Rimini, Half Triathlon, Rimini (May). This half marathon (1.9km swim, 93km bike, and 21.1km run) starts in the Adriatic Sea followed by a bike and run from the coast up into the gorgeous hills of surrounding Rimini. Participants must enroll with the National Triathlon Federation in Italy to participate (a daily license can be purchased for €30). The race can be completed as an individual or a relay team of up to 3 people. http://www.challenge-rimini.it/new/. Italy Man Half Triathlon, Lecco (June). For a more manageable race around Lake Como try this triathlon. The course includes a 1.9km swim, 93km bike ride, and 21.1km run. The terrane is relatively flat. italyman.it.